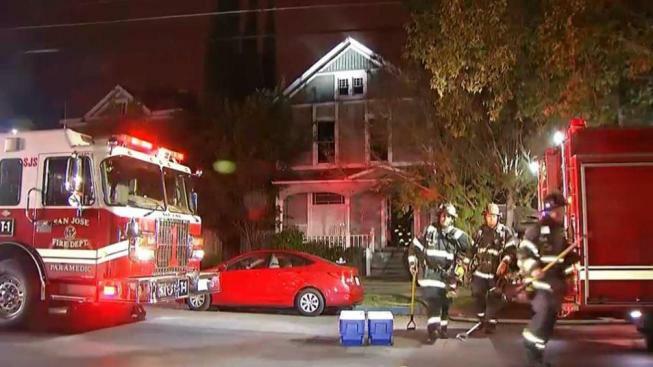 Firefighters on Tuesday managed to quickly knock down a blaze that broke out at a Victorian home in San Jose, according to the fire department. Bob Redell reports. Firefighters on Tuesday managed to quickly knock down a blaze that broke out at a Victorian home in San Jose, according to the fire department. No one was injured in the fire, which ignited along the 200 block of N. 9th Street, San Jose Fire Department Capt. Brad Cloutier said. A family of three people was displaced as a result of the blaze, according to Cloutier. Firefighters knocked down the flames in roughly 15 to 20 minutes, Cloutier said.